For the entirety of my collegiate career which spanned five years and now the two years since then I have had lower back issues. Disks bulging, a narrow spine, intense nerve pain, all fun stuff. I am still on pain meds and have had shots in my spine to numb the nerve in my leg, mostly to facilitate walking. For a while I have been looking for a mostly natural solution to the pain I live with. Then I saw this book. As soon as I was approved for this galley, I laid down on the floor and tried the basic stretches. I was cautiously optimistic and assuming it wouldn't give me too much relief the first go round. I was surprised when after gently pulling and stretching my muscles with exercises I vaguely remembered from physical therapy I felt a small amount of relief. I read on and tried over a course of a few months the exercises in this book. I am still surprised how much they helped me, especially the stretches. I'd wake up in the morning too stiff to move, do the stretches I could, and then be able to get out of bed. It's pretty awesome. This book isn't all stretches and exercises though. My favorite part was the different sections on life experiences. For instance, there was a whole section on how best to deal with your back during airplane travel, or driving, or working, or bathing! I liked being able to flip to the relevant section for me and check out the suggestions. There were some helpful tips. I really enjoyed this book and plan on buying it to have as a reference guide for whenever I may need to look something up. The stretches in this book I have already incorporated into my every day life and I don't see those leaving anytime soon. Though this may not apply directly to you, I figured our readers here would probably know someone with some back issues. Or even if you just wanted to learn some great back stretches, check this book out. It's a great resource for how to live life with the least amount of stress to your back, and that can be addabtalbe for anyone. As a physiotherapist (physical therapist for my American neighbours! ), books like this can be great, but I just wanted to pipe in with a quick warning. There are many, many causes of back pain, and the types of exercises that work for one type of back pain may not work for another type of back pain (or may even make it worse). It is always best to have an assessment done by a physical therapist before starting exercises on your own to determine if the exercises are appropriate or not. That being said, I will probably get a copy of this book to keep in my library to lend out to clients if their pain can be appropriately treated with the exercises in the book. i would never pick up a book like this but i do have back pain sometimes. i think just some stretching and stuff would help it and i slouch and do all kinds of bad things at work that probably make it work. i might check this out now. thanks! 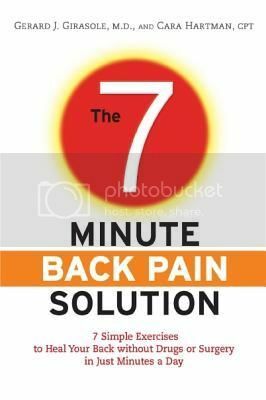 I wanted to buy that book, same as yours use it as a guide on what to do when having back pains. How much is the book? $12 on amazon from a quick search. I assume it would be the same at other retailers. Thank you so much for this review, it's on my wishlist now! I was just given the "well the next step is shots directly into your spine to deal with your pinched nerve" and thought I'd have to go for it given the shooting pain down my back and into my legs.... I went to a chiropractor for the first time this past week though and found that I'm feeling mostly better. Did the book mention anything about those sorts of alternative treatments? Also, you mentioned that the stretches reminded you of PT, I'm still doing my PT and have found it isn't working like it used to. Did you find that the exercises were new or do you think they'd be the same as what my PT gave me? Some of them were variations on the exercises that the PT gave to me. For example, one was lay on the ground both knees bent, then pull one to your chest and straighten the other. They are more stretching the muscles than strengthening them. That said, I have had the shots into my spine... I believe I have had about 10 over the past 7 years. They do help with the nerve pinching. I have a great doctor here in Cleveland. But now my pain is more muscular. Maybe check the book out from the library and take a peek at it. We don't want to have them hurt the back more, like the first commenter said. But the stretches don't seem to harmful to me. As for alternative treatments, I think they mention some but the book itself is suppose to be the alternative treatment. The main writer is a doctor and the other is a PT who has back issues and treats it solely with the book. I think the best bet would be to get it and look it over with your Dr or PT to make sure it wouldn't exacerbate it more, but it did help me. So many thanks for sharing, In my personal experience, Most of Back pain sufferers want to try all-natural approach to back pain without risky drugs or surgery. Excellent solutions, an all natural way is better than putting chemicals into your body or going under the knife. Thanks again, it's always great to see someone believing in something that works!